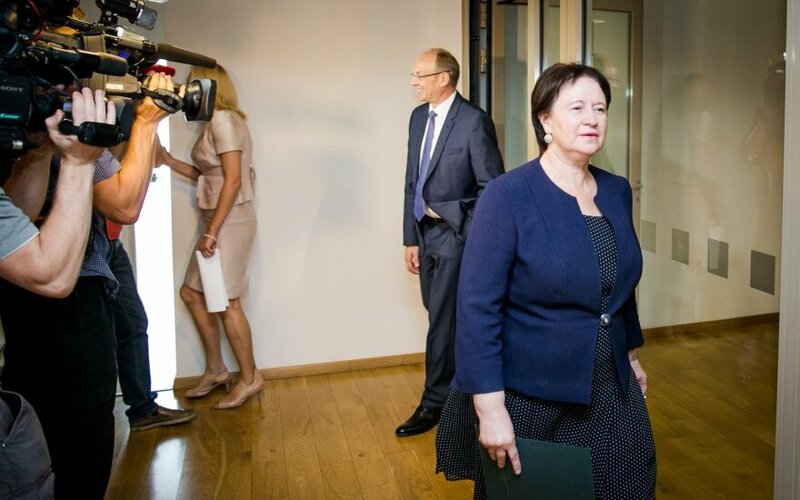 Responsibility of Lithuania's Agriculture Minister Virginija Baltraitienė should be assessed by the Labour Party that delegated her to the post, the board of the ruling Lithuanian Social Democratic Party stated on Tuesday. "The proposal of the Social Democratic Party's board to its coalition partners, the Labour Party, is to look into the responsibility of the agriculture minister as a minister and subordinate institutions. The Lithuanian Social Democratic Party is consistent and demanding in the evaluation of reputation of its ministers and expects the same from political partners," the board said in a statement. The Social Democrats' leader, Prime Minister Algirdas Butkevičius said after Baltraitienė's media conference on Monday he would wait for conclusions from the Chief Official Ethics Commission as to whether Baltraitienė did not have a clash of interests by attending a dinner and hunting event that also involved her Latvian counterpart and a few Lithuanian businesspeople. "When it comes to the minister of agriculture, I call upon the Chief Official Ethics Commission to draft its conclusion as soon as possible so that I could receive it and plan my steps," Butkevičius told journalists at the government on Monday. Earlier on Monday, Baltraitienė made a public apology to her Latvian counterpart, Janis Duklavs, over the situation in connection to the recent dinner and hunting activity in Lithuania, saying she had no reasons to step down. She said "paranoiac fears" were behind the scandal in Lithuania. The scandal broke out due to the informal dinner and hunting event that took place in the Panevėžys district, northern Lithuania, in late July and involved a delegation headed by Latvia's Agriculture Minister Janis Duklavs, Lithuania's chief veterinary officer Jonas Milius, Virginijus Kantauskas, CEO of meat processing company Biovela Group, and Dojus Agro CEO Petras Dailidė. Baltraitienė and Duklavs have provided conflicting accounts of the dinner. The Lithuanian minister said the businessmen had been invited by the Latvian minister, while the latter has denied the reports. "Regardless of elections or other problems, this is not the way to behave. Nobody will visit her, if that is how she behaves. After the mess I would tell her: 'My dear friend, come to Latvia, we have no mess here'," Duklavs told Latvia's TV3 news on Monday. Lithuania's President Dalia Grybauskaitė stated that Baltraitienė's dinner-and-hunting party was unjustifiable, adding that the minister's interpretations caused diplomatic tensions with the neighbouring country.